Monday marks the start of a new academic year at Carleton—it’s the first day of classes for fall term. As I write this, it’s the Friday before classes start, and I’m in my usual Friday-before-classes-start full-fledged panic about the start of the term. I’m actually in pretty good shape compared to previous years in terms of preparation. I’ve got the first week’s worth of readings and daily assignments posted on Moodle for both of my classes. I have a vague sense of what I’m doing on the first (and second, and third) days of each class, although I still have to find/tweak my handouts for the first day (and print out my photo rosters!). I revamped the problematic rubric for the first major project in my Computer Networks class. I’m in conversation with all three of my Comps (senior capstone) groups to nail down specific meeting times (two of the groups are sharing a class time slot so we need to subdivide the slot, and we won’t need the full time slot for the third group). I also locked in specific times for research on my calendar and filled in my known meetings/obligations, too. So why am I so panicked? Some of it is just general teaching nerves. I’m meeting a whole bunch of new-to-me students on Monday. Surprisingly, I only know about half of the students in my Computer Networks elective (a side effect of having so many majors is that I no longer know all of our majors). I’ve taught a few of the students in my Data Structures course before, but most of them are strangers to me right now. I know that in a couple of weeks, the students will be familiar to me and I’ll have a good sense of the dynamics of the class and of individual personalities, but meeting new people is stressful. A lot of it is a sense of dread over my workload. We failed to hire all of the visiting professors that we need to staff our courses this year. This means that we are still looking to hire people to teach Intro in Spring term (and maybe Winter, too), and that we had to cancel a bunch of classes, but it also means that I am teaching an overload so that we did not have to cancel one of our core courses for majors in the fall. Also, due to some bizarre scheduling constraints, all of my courses are loaded into just two terms (Fall and Winter). So, originally I was scheduled to teach 4 courses this year (1.5 in the fall, 2.5 in the winter, 0 in the spring). Now, I’m teaching 5 courses, with 2.5 each in fall and winter. * Luckily, they are all repeats for me (and I teach one of the courses twice this year), but that’s still a considerable load. Adding to the workload, too, are my chair duties, which on top of the usual chair shenanigans include running another tenure-track search (our third in three years, which means I’ll have run a search in each of my 3 years as chair). Plus two of my junior colleagues are being observed in the classroom this year, leading up to a tenure review and a third-year review next year. (Which, thankfully, I won’t have to chair!) So there are meetings and all sorts of other things related to preparing my colleagues for their respective reviews too. On top of everything, there are other changes, which adds to the general stress even though the changes are positive. 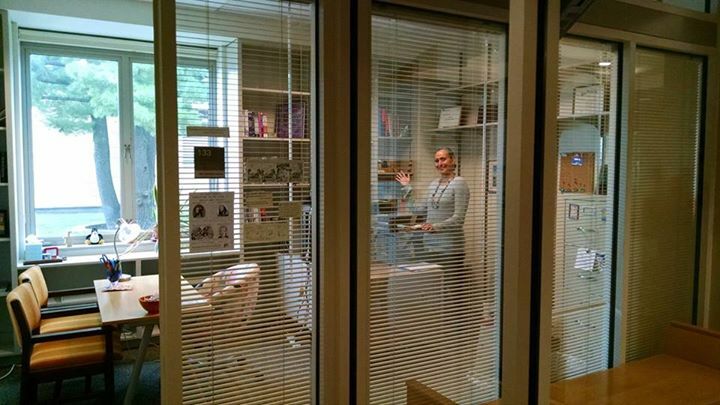 I’m loving my new office and my new neighbors, but still getting used to being 2 floors separated from my colleagues. (I can tell I’ll be running up and down the stairs a lot this year, which should at least keep me in shape!) We have a brand new faculty member who’s awesome and wonderful and has lots of questions about how things work here—which reminds me of how much mentoring/protecting of junior faculty the senior members of our department are doing and will need to continue doing over the next few years. My family’s all still getting used to the new schedules at home, since school started for my kiddos this week. Finally, next year I’ll be submitting my materials for promotion to full professor. While I’m confident about my case (I have tremendous support from my department and have a solid case), nothing is guaranteed, so there’s a general background stress around “have I done enough? should I have done things differently? what do I need to do this year to shore up my case?”. All of this has led to some sleepless nights recently and a general sense of dread about the academic year ahead. I like to go into the academic year on a positive note, but at this point I’ll take “semi-well rested” and “prepared enough to muddle through”. I sometimes start new academic years by picking a theme or resolution for the year. If I had to pick one for this year, it would be “self-preservation”. I know things will be tough until the spring, so I’m going to focus on ways to do my job while not burning out. I’m going to focus on survival and not reinventing the wheel (i.e. revamping things in my classes just for the sake of revamping them if I have something that works well enough already). I’m going to (and have already started to) say “no” with abandon (or, “I’d be happy to participate, but not until after mid-March.”). I’m going to stop at “good enough”. But I know I’ll also do what I do every academic year: have the privilege of meeting, teaching, and learning from an incredible group of students. And that’s what keeps me coming back year after year after year—even the years I know will be challenging. * The half course in fall and winter is for advising Comps—we get one course credit spread over 2 terms for every 3 groups we advise.